If you're in search of virtually silent, all-encompassing, unobtrusive warmth, radiant heating just might be what you're looking for. If this heating technology has piqued your interest, here are a few considerations to take into account. Thinking about installing radiant heat? Well, you’re not alone. The technology has already gained wide acceptance with consumers internationally, and though radiant systems haven’t yet become commonplace in the United States, more and more people are making the switch. Why? Radiant heating offers a range of persuasive, real-life benefits, from dramatic energy savings to unparalleled comfort. If you’re only just now hearing about the technology, make no mistake: Far from being a newfangled idea, radiant heat has existed, in one form or another, for thousands of years. It’s only recently, however, that such systems have profited from advanced engineering to become not only a viable alternative, but also a compelling option with many critical advantages over traditional forced-air. For one thing, compared with a forced-air system, radiant heat operates at least 25 percent more efficiently, according to a study by Kansas State University and the American Society of Heating, Refrigerating and Air-Conditioning Engineers. There are several reasons why radiant heat consumes less energy (and fewer energy dollars) than the older, increasingly outmoded heating method. A primary explanation is that radiant systems involve zero ductwork. Notoriously prone to losing air in transit, ducts are often leaky enough to compromise the overall efficiency of a forced-air system by as much as 50 percent. This heat loss means that you must pay more per month for an inefficient system to make up for this design flaw. In a home with radiant heat, there’s no such heat loss, so the homeowner enjoys much lower bills. While money savings certainly figures into the growing popularity of radiant heating, it’s by no means the sole factor at play. In fact, for many who convert, comfort outranks operating cost in terms of importance. So even though radiant boasts high efficiency, homeowners are more attracted to the high-quality heat it provides. Indeed, with warmth delivered at floor level, you get a qualitatively different experience than with a traditional heating method. While forced-air works in a stop-and-start fashion that can lead to uncomfortable temperature swings, radiant systems operate steadily and create even, all-encompassing, “everywhere” warmth. Plus, with no dust-collecting ducts, the technology safeguards indoor air quality. Another humongous difference: Radiant systems are virtually silent! If you’re sold on the superiority of radiant heating, then read on for a few considerations to bear in mind when it comes to installing the system in your home. Unlike traditional systems typically characterized by radiators, baseboards, and vents, radiant always remains out of the way, its parts removed from sight, slotted unobtrusively beneath the floor. Homeowners tend to appreciate the design possibilities afforded by a heating system with none of the usual bulky, unsightly in-room components. That said, the location of radiant panels implies a certain order of operations—that is, to be concealed by flooring, the panels must be installed before the floor. For that reason, custom home building offers perhaps the ideal opportunity to install radiant heating. 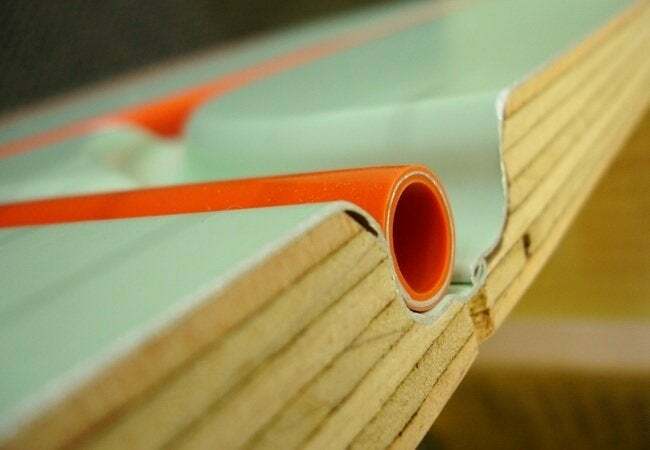 You don’t have to be building from scratch, though, in order to install a radiant system. On the contrary, if you’re renovating an existing home, the transition to radiant can be cost-effective and relatively seamless—so long as, in the course of your remodeling work, you were planning to pull up the floors anyway. In fact, to minimize the possibility of unevenness between the floors in different rooms, industry leader Warmboard manufactures a line of ultra-thin panels that are ideal for retrofit applications. Simply by virtue of its design, radiant heating offers unmistakable advantages over forced-air. Remember, however, that radiant technology has undergone many changes, particularly in recent years. There is a broad range of whole-home systems on the market today, and not all are equally adept in meeting the demands of modern families. Indeed, different systems rely on different components, and those components can greatly affect the performance of a given installation. As you most likely know, the majority of radiant systems rely on hydronic tubes to channel the boiler-heated water that indirectly warms the home. In some radiant panels, those tubes are embedded in a slab of gypsum concrete—a material that takes a long time to heat up and cool off. Being inherently sluggish, concrete works against the responsiveness of a radiant system. That’s why companies like Warmboard now build panels with aluminum, which is a staggering 232 times more conductive. Because aluminum transfers heat so effectively, these panels require less energy to achieve the temperature that’s set on the thermostat. 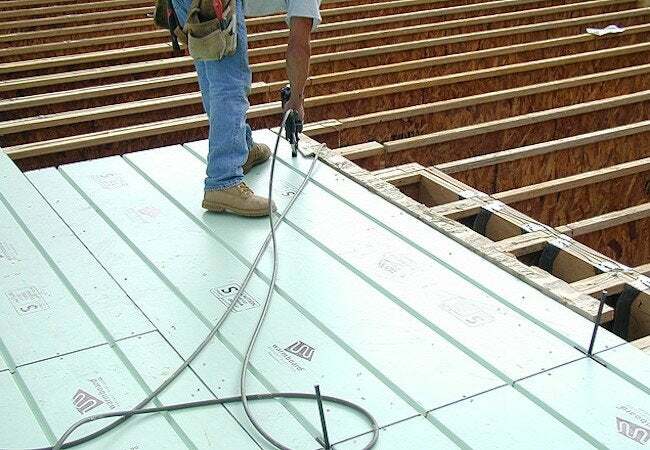 In fact, Warmboard requires the least energy of any radiant system. Because the boiler is able to heat the water in the system to a temperature 30 degrees lower than what other systems would require, you save 10 to 20 percent on energy costs—and that’s in addition to the savings you get from having chosen radiant over traditional heat! On account of its unique placement, radiant heating implicates flooring in a way that no other system does. That being the case, building industry professionals have spent years debating the question of which flooring types make the most suitable accompaniments. At a certain point, conventional wisdom held that while tile, stone, and concrete were acceptable choices, carpeting and hardwood were not. Fortunately, like other technologies, radiant heating has come a long, long way. For radiant systems to coexist with hardwood flooring, you once needed a buffer between the two, be it a sheet of plywood or a series of “sleeper” beams. The downside? Added layers can steal height from a room and detract from performance. With the advent of aluminum-clad panels, however, those concerns have largely subsided. Today, homeowners can even choose wall-to-wall carpeting, a floor covering that, because of its insulating properties, used to be off-limits in homes with radiant heat. Thanks to high-powered conductivity, systems like Warmboard can be paired not only with the thickest-pile carpeting, but also with any flooring material in common use today. In other words, the best in radiant technology places no restrictions on your design preferences, giving you total freedom of choice. Typically, large-scale projects affect the look of a living space. But when you opt for radiant technology, you’re doing something more important—improving how the home actually feels. Like any similarly integral process, installing a new heating system entails a number of key considerations, many of which may at first seem intimidatingly complex. In the end, though, it couldn’t be much simpler: Radiant heat means high efficiency and unparalleled comfort for years to come. What Do Homeowners Like Best About Radiant Heat?